What worked and for whom, and what are the implications for my teaching (learning inquiry)? The first question requires us to know our students; the second, to have (or acquire) the appropriate content knowledge and pedagogical content knowledge; the third, to assess what learning has gone on and in whose mind. The answer to this third question will have implications for our teaching - and possibly, our own learning. We may need to cast the net a bit wider in the search for a more effective pedagogy. 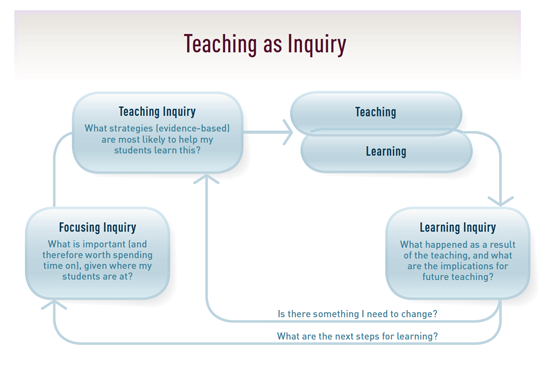 A cycle of inquiry is our best guarantee that we don’t carry on doing what we’re doing if it is not working for particular students or groups of students.